This is a copy of my letter to Nuts and Volts magazine as a follow-up on the article “Wart Remover” by Thomas Scarborough in their February 2005 edition. I never received any acknowledgement. I believe I have an even better device for this, judging from what it did to the only wart I've ever had. The ¼ inch wart, on the tender skin of my left wrist, persisted for three years and nothing I did to it made even the slightest difference. Drugstore freezing kits were useless. I took to clipping it off with flush-cutting dikes, being careful to not draw blood, but it would be back to cutting height within 10 days. I considered cautery by soldering iron but had the sense to do a web search, which discouraged that. 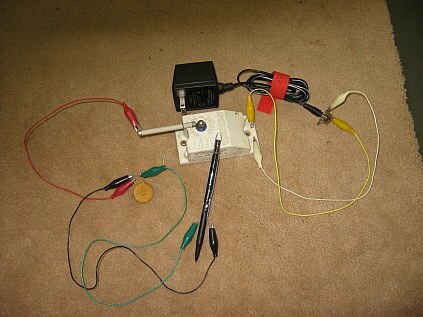 Then Scarborough's article came, and I put together a rough outfit with clip leads to pulse 24 volts from a power supply at 20 kHz (switching a FET using a square wave generator). It stung a little but didn't help a bit. Then months later (in July 07) I stumbled across something in my junk box and decided to try again. It was a sparker module from a gas stove: 24 volts AC in, sparks out at 5 Hz (able to throw about ¼ inch). I found a 24v AC wallwart, and taped two wires onto a plastic pen body, with the tips sticking off the end to make a spark gap probe, and connected it to the sparker with clip leads. And gave the beast a buzz. Didn't hurt at all, just a tad jolting. The sparks would jump straight down to the opposite sides of the wart (the spacing of the wire tips was a little less than the width of the wart). The sparks were faint and rapid. It seemed maybe a bit stunned a few days later. Then I thought, what about making the sparks DC? So I attached an old selenium high-voltage rectifier (focus rectifier from an old TV) and a 220 pF 3 KV capacitor for just a little charge storage. That gave brighter, louder sparks at about 2-3 Hz. So I zapped the wart with that. A bit more sting, but still not bad. I sparked it for only about 10-15 seconds. There was no immediate visible change, but a few days later I noticed that the wart had shrunk to less than 1/8 inch. So I banged it again, just briefly, and within a few days it was gone. I didn't think to take a picture of the wart, but here are a couple of photos of the “miraculous surgical instrument.” This discovery could have some value, considering how simple, almost painless, quick and above all effective it is. 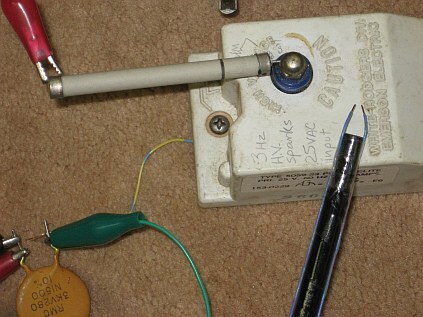 The yellow/blue wire below the rectifier connects the ground side to the capacitor. The polarity of the rectifier does not matter, but it had a lead only on one end, so I connected that to the spark output nut and was able to get a clip lead to stay on the leadless cap on the other end. The wires are not particularly high-voltage. The pen body is dressed with solid-conductor telephone cable wire. Rather than cutting the plug off the wallwart I just plugged it into a jack and used clip leads from it to the binding posts on the spark unit. Low-tech can work, if you don't mind it falling apart occasionally.